ImmortalHair should have more subforums so we can discuss topics ranging from politics to Earth's structure. I try to take the high road most of the time, but I just could not resist posting this. The lander really does look like a high school science play, or a low budget zombie alien movie prop. To redeem the post I will detail a but about how absurd the computing power was to power the pictured tinfoil trash can above.
" a system that can control a 13,000 kg spaceship, orbiting at 3,500 kilometres per hour around the moon, land it safely within metres of a specified location and guide it back from the surface to rendezvous with a command ship in lunar orbit. The system has to work the first time, and minimize fuel consumption because the spacecraft only contains enough fuel for one landing attempt. " Also it had emergency plans, and auto pilot functions/modes. So what kind of super processing computer was used ?
" While it was handy, AGC wasn't particularly powerful having 64 Kbyte of memory and operating at 0.043MHz. In fact, it was less equipped than a modern toaster!" " Put simply, the iPhone 6's clock is 32,600 times faster than the best Apollo era computers and could perform instructions 120,000,000 times faster "
Has been quite a while since I updated this thread. In summary it is an exercise in scientific method, challenging assumptions, critical thinking, and constructively exploring paradigms with diligent logic. Of course this parallels with exploring natural hair treatments and new methods, often requiring self experimentation and inventing new processes. I was listening to a fringe video today about how little trust there is among the general population of the government being truthful . 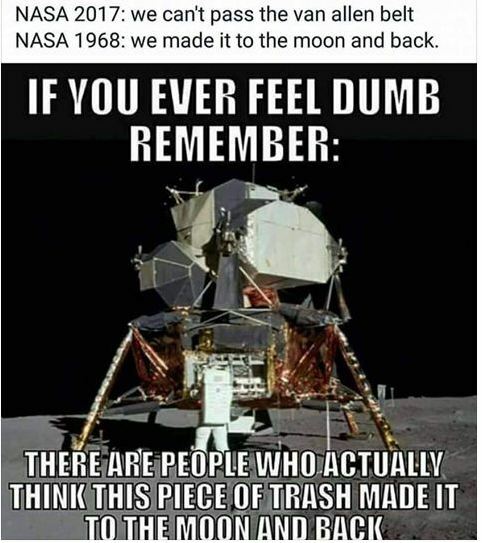 When it comes to the government space program, so many people take the data as truth. The data is often admitted CGI, composites, enhanced, filtered, and artistically dramatised. In the end, very few people have any direct verification methods to evaluate with, but get upset when somebody challenges the fundamentals of space "facts". I don't expand this thread often so it does not diffuse the impact of my own DT-CPR method that absolutely regrows terminal hairs slowly. Well it took radical and well thought out methods to develop such a radical method that has been heavily detailed and documented, and works. So here is the paradigm altering addition for today. For the traditional model of orbit dynamics is explained as follows. The earth circles the sun every year. So on a summer at night you are looking away from the sun into the universe, and see a set of stars. 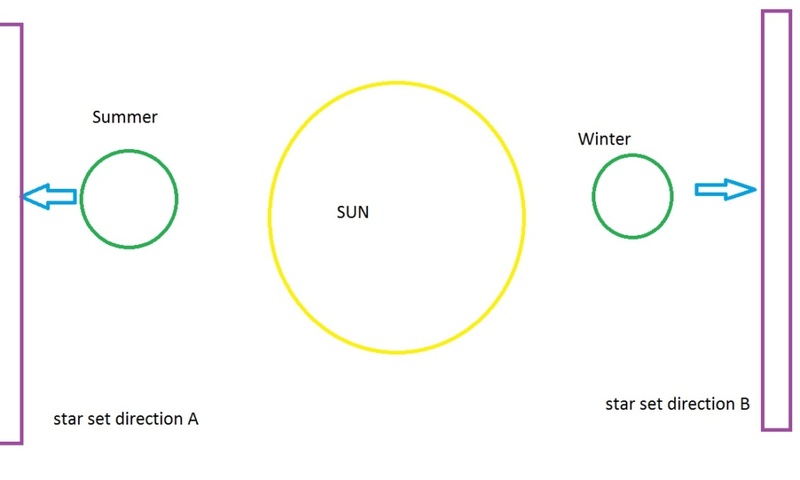 When it is winter, the earth is on the other side of the sun, on the other half of the orbit. At night you are looking away from the sun in the opposite direction from where you were pointed in the summer. You should see a whole new set of stars, as you are looking at a different area of the universe. Well the stars pretty much stay the same, big dipper , Orion etc, all year around, not moving much . At least a great deal of the stars should be hidden part of the year. Hidden behind the earth and the sun. Obviously what is observable is not in harmony with the traditional model explanation. If there is a good science explanation I hope it gets posted. I am not a big star gazer, but this seems pretty obvious. Take a look at the simple diagram and the logic is quite clear I think. On page 2 of this thread I posted about oil being not exclusively sourced from dead animals or plants; and speculated that it could be made from carbon and pressure in the earth or synthetically. This is known as abiotic oil. Recently I discovered that since 2015 Audi and the German government have been producing "blue crude" from air, water, and renewable energy. The pressure is not super high (400 psi) and the temperature is that of a cooking oven. It is so much like normal oil that it can be refined by standard processes to a diesel fuel. The myth of limited oil supplies may be just to justify the price. Think about all of the oil products .. plastics, lotions, asphalt,etc. Then electricity cooking, etc.. that can be basically sourced from air derivatives. If oil is being renewed in the ground, and it can be mined and processed for the low of $27 USD per barrel with profit; what would happen to the price if it was known to be not rare or a limited resource ? This is just real evidence of how proper modelling and evidence can lead to real life improvements and opportunities. This fuel is super clean and would improve the world. Exploring beyond the traditional modelling of "oil is from a bunch of dead stuff " takes some learning, but inquiries like this yield actual breakthrough solutions. "The fuel is created from carbon dioxide, water, and electricity with a process powered by renewable energy sources to create a liquid energy carrier called blue crude (in contrast to regular crude oil) which is then refined to generate e-diesel "
cdto2012 wrote: If there is a good science explanation I hope it gets posted. I am not a big star gazer, but this seems pretty obvious. Take a look at the simple diagram and the logic is quite clear I think. There are good scientific explanations that debunk ALL of your crazy flat earth theories, you just don't have either the desire or the brainpower to do a simple search to find them. This latest post is one of your most foolish though because it can be debunked using only basic logic. To start, however, you are indeed correct that with the accepted model we would not see the same constellations at night during the summer as during the winter when looking out along the x-axis in your drawing, and the truth is that we don't. But the most glaring hole in your claim is that you've completely forgotten the y-axis, which does not change with the seasons, resulting in circumpolar constellations that are indeed visible at night during the entire year. cdto2012 wrote: So here is the paradigm altering addition for today. Haha, you do make me laugh though, I'll give you that. This is a complex subject and your explanation link was quite useful. I will admit , that I am not much of a star gazer.. so could be in error about this complex subject. I will share what seems obvious with your links response to the claim I made. You are referring to the tilt of the Y axis that provides the seasons. This is indeed different from the X rotation around the sun positioning. The star maps provided in the links are missing the latitude observation point, we have to guess from the text " Indian Prairie School District 204". Lets just assume somewhere in the northern latitudes. Of course as the article claims.. you do not see some of the same stars year round. They mention the X rotation, but this could be just as easily explained by Y axis rotation; meaning that the tilt of the earth hides some of the stars in the south. Some constellations are always visible due to the "upward" view never being diminished.
" In winter, we see the constellation Orion in the south at night and during the day the Sun is in the sky with the constellation Scorpius. In summer, we see the opposite (we see Scorpius at night and Orion is in the sky during the day). " If this is true, then for me I will agree that my limited understanding of the subject has been answered in your favor. The idea of unchanging stars as evidence is not valid. Thanks for sorting that out. I only want to deal with the scientifically based evidences. I do not know, and am not able to measure all things about the variety of subjects. I am interested in useful modelling, not bending stories to fit assumptions. Xenon and I debate most of the time, but we found some common ground on some of these far out topics. Glad that on our forum we can contribute things to consider together . if in 2019 we believe in flat earth, homoeopathy and that we never went to the moon, there is no critical thinking to see here. You have curiosity, that's good. Keep it for real science. yes , lets keep it to real science. Not just judgemental stifling jargon of closed minded opinions. There are plenty of topics here, pick a few and offer evidence, measurable examples, scientific logic, anything but bland elitist condemning opinions of the all knowing spectator. As you can see from the last few posts, real science is welcomed and appreciated here. sci show channel is a good start. They always post links( only scientific sources) about what they say in the video. furthermore -- You have the curiosity of a 12 year old pondering the mysteries of real science, but please grow up and learn what the real indoctrinated educated elite know to be true. There is a reason this thread has almost 5000 hits, it is not because it is even a big debate post. Mostly it is just thoughtful evidence that people find interesting. If it was just a bunch of my opinions and sloppy logic, it might have 500 hits. Also there are plenty of people that have different conclusions, but I see very few proper refutations posted. As you can see, they are welcomed here. I am being quite resistant to frivolous opinionated posts, because we do not need 2000 posts of people thinking that they are super important and their personal opinion is superior--- far out weighing any constructive evidence or logic previously posted. Neither is it useful to post general you tube channel with around 150+ videos that do not directly relate to the topics discussed. Any poser can post general youtube links and act like they are the grand professor of the science world, and all other logical paths are irrelevant. Just another way to suggest, here 12 year old kid, try a science channel, at least you can learn some basics. It's not personal. It's just sad to read these threads. All of us have the ability for critical thinking. Ι don't underestimate this fact. I posted the youtube link only because this channel is a perfect representation of how you examine a topic with real science. It has nothing to do with ''flat earth'' indeed. I really don't think they will bother making such videos, to be honest. There is no reason to do something like that. This channel has plenty of interesting topics if you like science. cdto2012 wrote: On page 2 of this thread I posted about oil being not exclusively sourced from dead animals or plants; and speculated that it could be made from carbon and pressure in the earth or synthetically. This is known as abiotic oil. This is just real evidence of how proper modelling and evidence can lead to real life improvements and opportunities. This fuel is super clean and would improve the world. Except instead of spinning the wheel in onedirection, spin the wheel in two opposing directions the way scalar works. Interestingly, some lights on ufo’s have been seen to do this. I wonder if megalithic structures like the recent one in florida coral castle was built like this. Further when Combining with super high frequencies that are currently being used to levitate objects would make objects more stable. Again, some ufo’s have been left an area of high radiation. This will trigger another debate. Feel free to post your videos of general scientific interest. I have worked for years in renewable high tech energy and had a major lab for many years. I don't even mind if people want to post about far out things like the "secret space program" and it's many rabbit holes. This was meant to be a refreshingly interesting thread, some entertainment value, some exploratory, and some just to see how the theories held up in a public place. Even the science channel that was previously linked looked interesting, it just was not directly related to the debate subject. We have an approved protected place to freely share constructive ideas, let it be something that people contribute to, and make it unique and valuable. My friend just had to do some work in China, he said he could not access You Tube, and many other social media and useful sites. Here have some freedom, and an audience of progressive and creative people... these treasures can lead to the breakthroughs that shape the future.